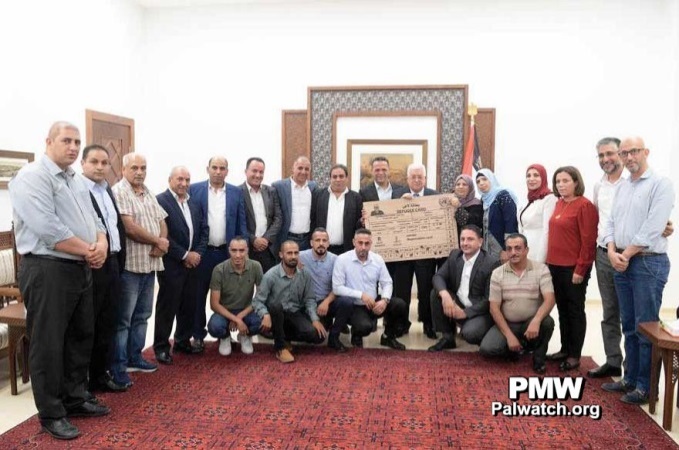 The picture accompanying the article shows PA Chairman Mahmoud Abbas standing with the delegation and holding a large poster meant to resemble a UNRWA refugee card, which has his picture and name on it, and the text “Refugee Card” in English and Arabic. 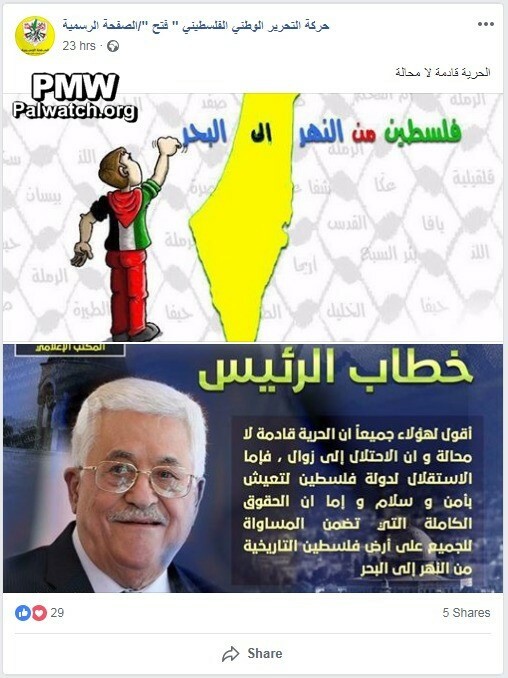 Images posted on Fatah Facebook page: "Palestine” is “from the [Jordan] River to the [Mediterranean] Sea"
Posted text: "Freedom will come, without a shadow of a doubt"
The first picture shows a boy, with a shirt in the shape and colors of the Palestinian flag, painting words "Palestine from the [Jordan] River to the [Mediterranean] Sea" across the PA map of “Palestine” that presents all of Israel as “Palestine” together with the PA areas. In the background are the names of different cities, located both in Israel and in the PA areas. 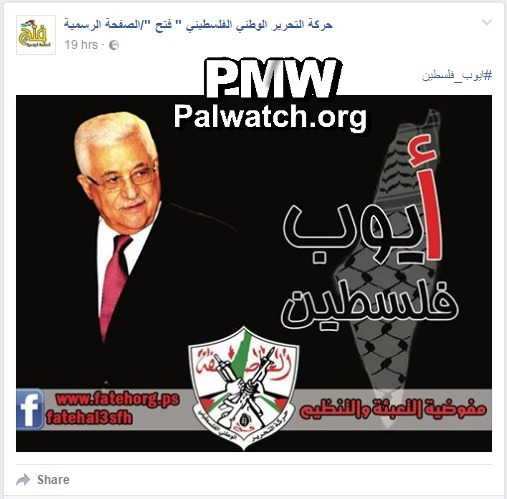 Text at top of picture: "Fatah Movement / Mobilization and Organization Commission"
Text in upper right corner of picture: "[PA] Ministry of Information"
'I say to all of them that freedom will come, without any shadow of a doubt, and the fate of the occupation is to come to an end. Abbas distorts history: Israel is Europe's "colonialist project that is not connected to Judaism, but made use of the Jews so they would serve as pawns"
There is an important matter – how will the Jews immigrate [to Palestine]? The Jews do not want to immigrate because of killing and slaughter. Even during the Holocaust that took place they did not immigrate [to Palestine] (sic., there were many attempts to immigrate to the Land of Israel, many of which were blocked by the British). By the way, the number of Jews in Palestine in 1948 did not exceed 640,000, and most of them came from Europe. [Theodor] Herzl [a founder of modern Zionism] used to say: 'Antisemitism is the engine of Zionism' – in other words, the more antisemitic a person is, the more beneficial he is to us [the Jews]. This is because he advances the Zionist goal – to expel the Jews from their countries to Palestine." PA Chairman Mahmoud Abbas in a speech to PLO Central Council: "Egyptian intellectual Abd Al-Wahab Al-Masiri, one of the most important writers on the Zionist movement and Judaism... He described this entity as following: 'The functional nature of Israel is that colonialism created it in order to fill a specific role. It is a colonialist project that has no connection to Judaism.' It has no connection to Judaism, but the Jews were used as pawns and they were [made pawns] by way of slogans such as 'the Promised Land,' and 'the Beloved Homeland.' These slogans were invented for them, and they were brought here." PA Chairman Mahmoud Abbas in a speech to PLO Central Council: "There is an important matter – the Jews' immigration [to Palestine]. The Jews did not want to immigrate, not even because of killing, slaughter. They did not want to immigrate. Even during the Holocaust that took place, they did not immigrate [to Palestine]. They did not immigrate... [Theodor] Herzl (i.e., founder of modern Zionism) used to say: 'Antisemitism is the engine of Zionism. The more antisemitic a person is the more beneficial he is to us because he advances the Zionist goal by expelling the Jews.' They [the Europeans] wanted to get rid of the Jews there for their reasons and to benefit from them in our land - killing two birds with one stone." “Al-Quds Open University held its sixth scientific conference on popular heritage yesterday [Nov. 8, 2017], titled The Popular Heritage Conference in the Jenin District and the Galilee: Identity and Belonging, and this was under the patronage of [PA] President Mahmoud Abbas. “This year, our nation marks one hundred years of the Balfour Declaration. Lord Arthur Balfour was a British foreign secretary who decided to change the identity and fate of Palestine, a land that he did not own, by promising it to the Zionist movement, and dramatically altering the history of the Palestinian people. On this somber anniversary, it is important to recall some key historic facts, which remain relevant for achieving a just, lasting, and peaceful resolution to a century of injustice..."
Mahmoud Abbas: Israel's right to exist is a "lie"
PA Chairman Mahmoud Abbas: "Ninety-nine years have passed since the ominous Balfour Promise (i.e., Declaration). The unfair [promise]. However, we will not turn the lie (i.e., Israel being the ancient Jewish homeland) into an accepted truth. Our people’s right to its homeland is permanent and authentic. It does not expire, not even if historical facts are falsified. Palestine will remain despite the Nakba (i.e., “the catastrophe,” establishment of the State of Israel in 1948), the Naksa (i.e., "the setback," Israel's victory in the Six Day War in 1967), and the suffering which has continued for decades. We will never raise the white flag. [Our flag] will continue to be composed of the four colors." Abbas: "We say to those who gave this promise: ‘‘You [Britain] gave what is not yours to one [the Jewish people] who has no right to it.’’ Many have wondered: Why are we talking about it now? We said that the right does not expire, that the right does not age. Even after 100, 200, 1,000 [years], the right will remain alive. It will remain our obligation to defend our right. Balfour, who gave you the right to sell our land? And to tell people [the Jews]: ‘‘This is a homeland for you [the Jews].’’? ... Give them [a state] in Britain, man, in Scotland, or at least in Ireland. Why in Palestine? He gave [Jews land] in Palestine and that became their right. No! Britain must first acknowledge that it made a mistake regarding our right. Abbas plans to "put Britain on trial for the Balfour Promise"
“Britain has refused to submit an apology for the Balfour Promise (i.e., Declaration) that was issued in 1917 and paved the way for the establishment of the State of Israel. [PA] President Mahmoud Abbas demanded that Britain officially apologize to the Palestinian people for this promise in a speech that he gave before the UN General Assembly in September , but Britain is intending to hold celebrations together with senior Israeli officials for the 100th anniversary of the Balfour Promise on Nov. 2 . The Balfour Declaration of Nov. 2, 1917 was a letter from British Foreign Secretary Arthur Balfour to Baron Rothschild stating that “His Majesty's government views with favour the establishment in Palestine of a national home for the Jewish people” and is seen as the basis for later international commitments to establish the State of Israel. PA Chairman Mahmoud Abbas: "We will continue to make our demands of Britain. Our demands are not secret. They asked: What do you want from us? We said: Say ‘Sorry’ and recognize the State of Palestine. They said: It is problematic. We said: So we will submit a lawsuit against you in the international courts and in the courts in Britain. will not concede our rights. You committed a crime against the Palestinian people, and that is the Balfour Promise. 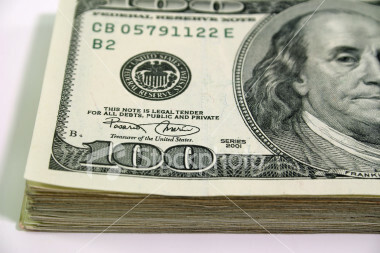 A promise of one who is not the owner to one who is undeserving." Abbas on the Balfour Declaration: Britain "must apologize for this historic mistake"
[Mahmoud Abbas:] “I have said that we will turn to all of the local and international forums and talk to them..."
Abbas claims Palestinians have been under occupation for "70 years"
[Q:] "We will begin with the main event, and that is the phone conversation that American President Donald Trump had with you, and your important meeting with his Special Representative for International Negotiations Jason Greenblatt. What was said in your first conversation with the US president, and did his conversation constitute a plan to eliminate the Palestinian cause, and not to resolve it?" [PA Chairman Mahmoud Abbas:] "This was the first time I spoke with Trump... I told him that we hope that he will find a solution to the Palestinian issue after 70 years of occupation that will be based on two states..."
The image shows PA Chairman Mahmoud Abbas and the PA map of “Palestine” that presents all of Israel as “Palestine” together with the PA areas, overlaid with a keffiyeh (Arab headdress). PA Chairman Mahmoud Abbas: "Yesterday [Feb. 7, 2017] the British government announced that it invited Israeli Prime Minister [Benjamin Netanyahu] to attend the ceremonies to mark the 100th anniversary of the issuing of the Balfour Promise (i.e., Declaration) in 1917. This is a matter that surprises us and which we condemn. We demand that the British government apologize to the Palestinian people for the destruction and expulsion that were carried out against our people... The government of Britain did not have a connection to the Middle East and Palestine in 1917. It said ‘we will give Palestine to the Jews as a national homeland.’ Now it [Britain] comes and holds a ceremony in honor of this. We say that such a decision gives to one who has no right, from one who is not the owner. However, the State of Israel exists. We cannot deny this, it exists! It does! However, the government of Britain, which sinned against our right and wrote in the Balfour Promise [interrupts himself] - it completely denied us in the Balfour Promise and did not mention us at all – it was expected that it would apologize, no less and no more." A similar item appeared on official PA TV News on Jan. 14, 2017. 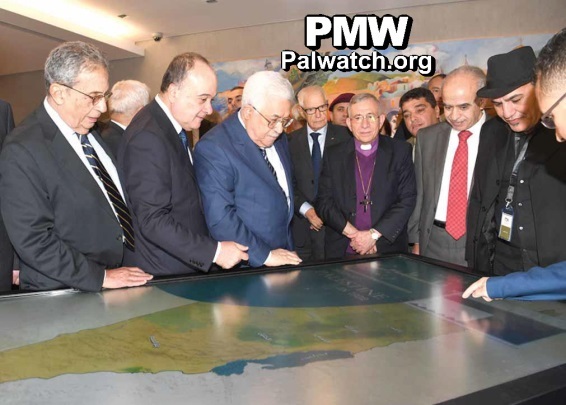 The article includes a photo showing PA Chairman Mahmoud Abbas in the museum with the PA map of “Palestine” that presents all of Israel as “Palestine” together with the PA areas. The word “Palestine” in English appears on the map. “Official [PA] Presidential Spokesman Nabil Abu Rudeina described the Balfour Promise (i.e., Declaration) as the crime of the century, and emphasized that it will not pass in silence.